Allan Beecham comes from a long line of woodworkers and turners - his grandfather made chairs for Queen Victoria - so it was natural that he should become a turner too. He was taught to turn at the age of 13, in 1953, chiefly by his father, Sidney Albert Beecham, who worked for Ginger John in Hackney, north-east London. Allan got a Saturday job with Jack Harris, who helped him understand the importance of shape and balance in turnings. He made collars to connect the top of wine tables to the column beneath, and was paid 'a tanner' (21/2p) for each one. His first job, at 15, was as a borer with Jason and Lawrence, in Stepney, doing the long-hole boring in standard lamps. His turning education continued in the East End, with instruction from men such as Sid Massill, Jack Harris, and Graham Lowe. In 1967, Allan's father, three brothers and he set up their own company, Beecham and Sons. Most of their work was for the trade, but they also turned wine tables and, later, other tables and cabinets. 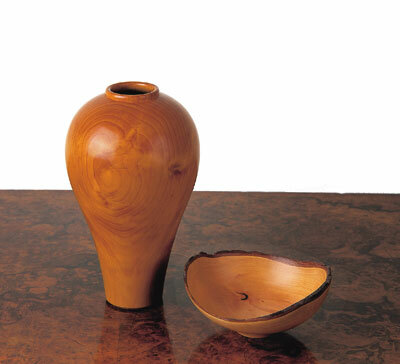 In 1980, with the blessing of his family, Allan started his own business - Calamus Woodturning, based first at Horam, then at Burwash, East Sussex. The name comes from a poem by Walt Whitman. One of his most interesting projects was to turn parts for five gazebos at Euro-Disney, near Paris, including one on the Main Street. It involved making finials, drop finials, columns, wheels and other assorted shapes - three months' solid work, working some 12 hours a day, seven days a week. He also turned all the parts for a font designed by Phillip Holden for 'the woodturners' church, St Brides, off Fleet Street. Allan is mainly a 'jobbing' or production turner, with 85% of his work being making spindles for quality furniture makers and similar businesses. But he also does amazing twist work, thread chasing, hollow forms, boxes, bowls, thin-stemmed goblets, bent chair legs and miniatures. At the other end of the scale, he specialises in long, large or otherwise difficult pieces, including graduated, tapered twists and spirals that can't be turned easily on a production or copy lathe. Large works don't scare him. One commission was for a 10- foot long by 15-inch diameter Douglas fir column to replace a rotten one in his village. It took three men to lift the sawn length of timber onto his lathe. More recently, he has made a mace in ebony for the Worshipful Company of Basketmakers, and a lectern for the Worshipful Company of Turners, for which he is an assessor. Allan was part of the five-man committee that came up with the National Vocational Qualification (NVQ) for Britain. He reckons all you need to be a fine turner is good hand and eye coordination - and lots of practice. Even if your eye is not that good to start with, you can develop it, he says. When he gives a talk or demonstration, he shows three similar spindles, one turned properly and two, badly. He asks the audience to detect which is which, and why one is better than the others? He likes demonstrating screw-lid boxes and has a collection of old cutters and hand thread chasers, including some made by Holtzapffel and J.Buck. Now that he is semi-retired, he does more artistic turning. His most recent development is to turn Intertwines, where wood of one colour is twisted with another. "All you need to be a fine turner is good hand and eye coordination - and lots of practice"